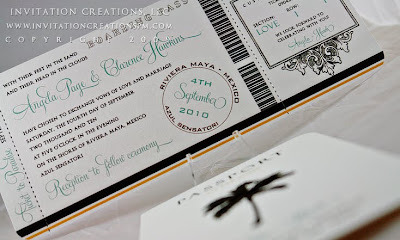 Angela found me via my blog and fell in love with a previous design I had done of a boarding pass invitation. She also was getting married in Mexico and thought it was perfect for her wedding! We made minor changes like adding a touch of orange to the existing design. We also addressed the envelopes to complete the look. 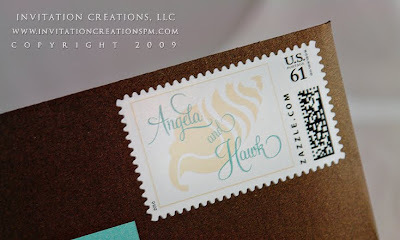 Angela ordered these custom stamps I designed and as I have said many times before, I love the look custom stamps bring to an invitation. 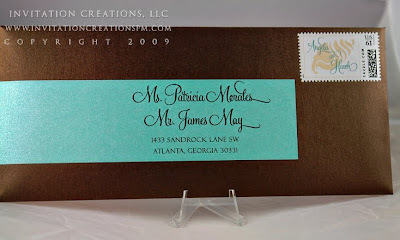 Thanks Angela for choosing Invitation Creations, LLC as your preferred stationer!